Special Instructions: This paper has two parts. Part-I consists of 50 questions common to all, which is compulsory and carries 2 marks each. Part – II has Four sections viz Hindustani, Karnatak, Rabindra Sangeet and Percussion Instruments with 25 questions each of 2 marks each. Candidates should select any one of the Part II section / Part III / Part IV / Part V as per his / her discipline. 1. Which of the following instrument is used by ‘Bhopas’ of Rajasthan while reciting ‘Lok Katha’ of ‘Pabuji’? 2. ‘Langas’ and ‘Manganiars’ are the folk singer of which of the following states? 5. Who wrote Grantha ‘Kalanidhi’? 6. Who is the author of “Music of India”? 7. Which one of the following statement is correct? (A) Music has the quality of nonverbal communication. (B) The society disagrees with the psychotherapeutic value of Music. (C) Creative self-expression cannot be expressed through music. (D) Music is the main cause of the ailments related to nervous system. (A) Choirs are composed only for the purpose of Marching Songs. (B) ‘Rasa Nishpatti’ is not expected from choir singing. (C) Choir singing generates the feeling of responsibility, cooperation, self-control and attentiveness. (D) Participants of choir, gradually deteriorate their voice quality. 9. Which of the following ‘rasa’ is derived from ‘Sandhiprakash ragas’ having ‘Re Dha Komal’ according to Pt. Bhatkhande? 10. The folk song of Rajasthan – “Kesariya Balam Aao Ni Padharo Mhare Desh”, is sung by which of the following artist? 11. Which Sarangi Player was awarded by Padmbhushan? 12. Which of the following term is used as a synonym of ‘swara’ in Samveda? 17. Rabindranath used which nickname to compose Vaishnav padavali? 21. Matras of Tisra triputa tala is equal to which tala of Hindustani music? 23. Which one of the following scale is used in folk and classical music both? 24. An art form in which least tools are required is considered to be the best art form. From this point of view, which of the following is the best art form? 25. Which one of the following statement is correct? (A) Hindustani classical music is a completely precomposed music which does not provide space for improvisation. (B) ‘Jati Gayan’ is the main musical form of modern Hindustani classical music. (C) Hindustani Classical Music provides sufficient space for the imagination of an artist within the discipline of Raga. (D) Hindustani Classical Music does not have a definite ‘Tala System. 26. Kishori Amon kar is a leading vocalist of which of the following ‘Gharana’? 34. Assertion (A): Tihai is very important in the field of Tabla playing. Reason (R): Because most of the compositions end with Tihaies. (B) (A) is wrong (R) is correct. (C) (A) is correct (R) is correct. (D) (A) is wrong (R) is wrong. 40. Who is not a singer from the following? 41. Which Sitar Player does not belong to Etawa Gharana from the following? 43. ‘Ga Ma Dha Dha Pa’ belongs to which Raga? (B) Mishra Lalmani, Bhartiya Sangeet Vadya, Year, Page No. (C) Bhartiya Sangeet Vadya, Mishra Lalmani, Year, Page No. 57. Identify the correct group which depicts the components of ‘Chaturanga’? 58. Which of the following posture is ideal for singing? 59. Who is the first Woman ‘Shenai’ player of Hindustani Music? 60. Which of the following term is used for the wavelength of sound? 62. Which of the following ‘Gharana’ is known for ‘Ashtanga gayki’? 64. Major Scale of Western music is equivalent to which scale of Hindustani Music? 67. Which instrument is not played by Mizrab from the following? 68. Which baj is not belonging to Sitar from the following? 69. Which one of the following statement is correct? (C) Pt. Omkar Nath Thakur was trained under the guidance of Pt. Narayan Moreshwar Khare. (D) ‘Hamare Sangeet Vadya’ is a great treatise of Pt. Omkar Nath Thakur. 70. According to which notation system the ‘swaras’ are known as Do, Re, Me, Fa, Sol, La, Si? 71. ‘Kharaj Bharna’ is used for which of the following process? 73. 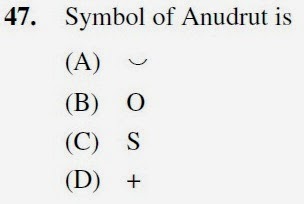 Which set is not correct? 74. Which musicologist adopted the Sansthan system for Rag Ragini classification? 75. In which text the scientific analysis of ‘Shruti’ is found? 51. Which Rabindra Sangeet is composed in Raga Malkauns? 53. Which classical vocal style is influenced Rabindranath Tagore mostly? 54. Which taal is founded by Rabindranath Tagore? 55. Which song is not composed in Shasthi Taal? 57. Which is not a drupadang composition of Rabindranath Thakur? 58. Which song is not included in the “Vichitra Paryaye” section of Rabindra Sangeet? 59. 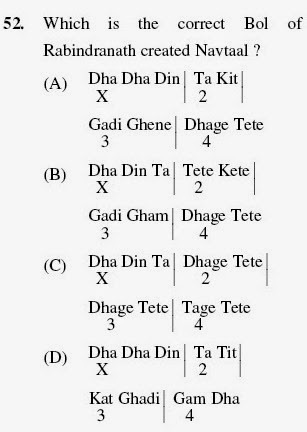 Which set is correct for the song “Tomare e Koriaachhi Jibaner Dhurvotara”? 60. What is name of Rabindranath Thakur’s wife? 62. Which song is not included in the Prem Parayaye of Rabindra Sangeet ? 63. Which song is not included in Bhanu Singh Padawali written by Rabindranath Thakure? 64. Which song is not a Dhamarango Rabindra Sangeet? 66. Which Rabindra Sangeet is not included in Kirtan style? 67. Which Rabindra Sangeet is based on Western Music? 71. In which of song Rabindranath use taalpherta? 73. Identify the Philosophical theme behind the creation of Natir Puja? 59. Which one is not a kind of yati from the following? 61. Assertion (A): The tabla players of Banaras gharana produce Ta or Na on Lav (maidan) with index finger making ring finger in round shape. Reason (R): Due to this resonance is increased and ‘Khula Naad’ is produced. 64. Jal Tarang belongs to which category of instruments? 68. Which patakshar from the following is played by Mukta Prahar?